Ochakovskii Kvass (Очаковский Квас) is Russia’s most popular commercially-produced kvass. According to the independent Nielsen polling agency, Ochakovo controls 18% of the highly competitive kvass market in Russia. Kvass is a fermented beverage popularly enjoyed during the summer and is considered something of a national drink in Russia. It’s hearty and tastes distinctly of sour bread. In Russia, there’s an old saying along the lines of “bad kvass is better than good water” and, due to the fermentation process, this can be considered at least somewhat true. In 1913, Russian biologists demonstrated the drink’s healing qualities when they used kvass to kill typhus bacteria. Today, it’s also known to improve digestion, reduce fatigue, quench thirst, and provide plenty of vitamin B. The company Ochakovo began as a state enterprise in 1978 to provide beer and soft drinks for the 1980 Summer Olympics. It now distributes to 60 regions inside Russia and more than 30 foreign countries, including Greece, Germany, Spain, Canada, China, and the United States. Since the 2000’s, Ochakovo has exclusively sourced their ingredients from 100% organic, GMO-free farms. These ingredients, according to their website, are closely monitored from field to bottle and are produced without additives or preservatives. Ochakovo uses traditional brewing technique called “double fermentation” that has largely fallen out of practice in favor of artificial flavorings. Although flavorings are cheaper, the kvass produced with them lack the real heartiness and flavor of traditional kvass. Kvass has long been produced in the Russian home. The drink is traditionally made by pouring boiling water into a bowl filled with baked (or stale) rye bread. The mixture is left to set, and is then strained and combined with a yeast-and-sugar concoction. The natural fermentation process does give kvass a small alcohol content – but no more than would be found in natural root beer, kombucha, or even much more than can be found in many yogurt drinks, which are also fermented. You can read more about it here. Today, it’s far more common to buy kvass commercially than to produce it at home. Kvass now now be found in stores in a variety of styles and flavors. 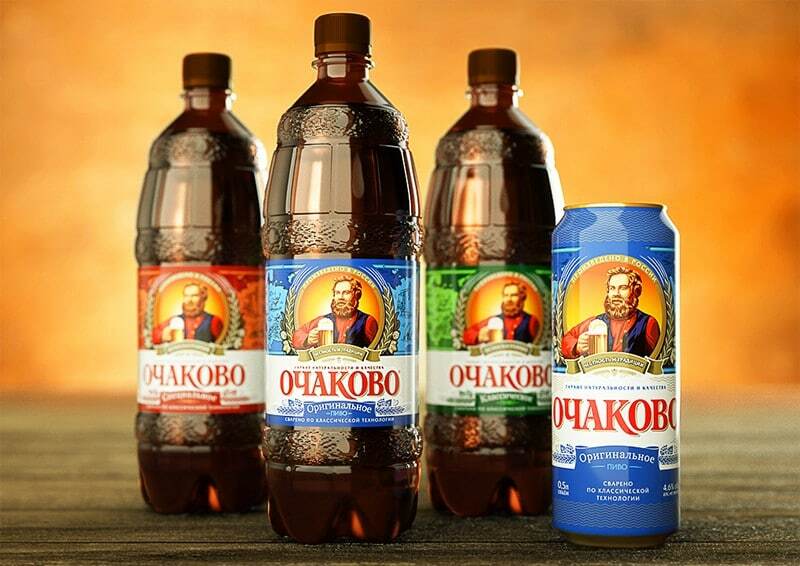 The Ochakovskii Kvass line includes a classic dark brew (Очаковский), a special children’s brew (Квасёнок), a traditional flavor (Русский квас), and white kvass, known as their “family secret” (Семейный секрет).